On 22nd April 2017 Inside the Masters of Dirt, the world's wildest unscripted motocross reality series, will launch exclusively on INSIGHT TV in 4K UHD. Produced by Masters Of Dirt (M.O.D) and XTreme Video, the series follows the adrenaline-addicted crew that produces the popular freestyle motocross arena show of the same name. Boasting upwards of two million fans on social media, their larger-than-life personalities, crazy day-to-day antics and the epic visual nature of their shows will drive their huge YouTube following to the big screen. XTreme Video is the one of the largest multi-platform networks representing around 500 extreme online content creators and social influencers from motocross, BMX, mountain biking, surfing, skateboarding - the list goes on. It began working with the M.O.D crew in March 2016 traveling to stunning locations across Europe and Dubai, shooting their everyday activities and their huge arena shows for INSIGHT TV's six-part Inside the Masters of Dirt series. XTreme Video wanted to combine the experience that the M.O.D crew has shooting footage of the arena shows for digital platforms and their own experience of bringing the best content to TV networks like INSIGHT TV. It also wanted to give the crew's massive social media following greater access to their everyday lives shot in the highest quality 4K UHD. Originally from Austria, the M.O.D crew are a group of friends who are complete Freestyle Motocross (FMX) geeks. Prior to working with INSIGHT TV and XTreme Video they showed off their skills online and on local TV. They are part of a worldwide wave of XTreme creators and social media influencers that have become celebrities to the 16 to 24-year-old Generation Z demographic. Gregg Bywalski, CEO XTreme Video says, "TVs biggest challenge right now is to reach that younger audience because they don't watch TV, they've found their new influencers online. When we bring them to the TV screen we don't want the programme to be like any other TV show. They need to have their own show and they need to have something that they can't get online and that's what we're doing with INSIGHT TV and Inside the Masters of Dirt. The beauty of the show is that the viewers can see what these guys do outside the arena in their everyday lives. At the end of the arena shows they don't go their separate ways: it's a community, they eat together, work together, party together and fight together. The viewers get to see what goes on behind the stunts and the crashes and that's a real draw for Generation Z." As well as being hugely influential to the younger demographic, Xtreme creators are also important to technology providers. Action sports filmmakers and outdoor photographers are always early adopters of the best technology in filmography, filmmaking, virtual reality and the latest in 4K UHD footage. 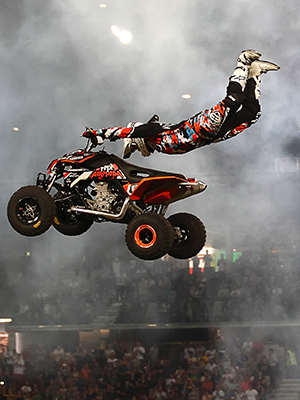 Higher frame rates and the very best in high-definition quality is essential to the filming of the world's most extreme stunts and performance sports. It's impossible for viewers to capture the essence of the action without the most detailed capture of its impact from the field. The massive success of action cameras is due in part to the fact that Xtreme creators quickly adapted to the camera and understood how they could use it. They were the first to try 3D, HD and now UHD, which is a perfect fit for this genre of TV due to the visual nature of the show and how precisely it reflects the moves they make on the bike in whichever stunt they perform. Then there's the scenery in many stunning locations. For the arena shoots the stunts are carefully choreographed and are executed precisely but the end result is always unpredictable as the potential outcome of risky stunts, tricks or feats, even in an enclosed venue or at big stadium shows, can never be known exactly. The production team rigs the shoots so that they can capture the very best angles and shots for the INSIGHT TV show. Most of the action is recorded on two Sony FS700 4K UHD cameras using Odyssey 7Q 4K recorders. One of the Sony cameras is fixed with a wider lens on a Steadicam set-up. The crew also uses a Sony A6300 UHD camera when it's not possible to use the larger cameras on location, in cars and at parties etc. Other than the amazing visual quality that 4K UHD brings there are other benefits to shooting in UHD. Bywalski explains, "UHD allows us to capture larger scenes. At the editing stage, we can use close ups of those scenes, which means that we can zoom in one area of the image and capture the moment in UHD, which is amazing." However, despite the huge benefits that UHD brings there is a big technical gap. He adds, "We need operators to provide more UHD signals to end users because UHD is the next viewing experience for consumers around the world, there is no doubt about that. 3D was just a gimmick but UHD is something that's going to come very quickly and be adopted by everyone." As well as the many advantages, the M.O.D team also faced some challenges during the shoot such as working with a travelling production crew, which could be difficult. They had limited time to charge equipment, prepare for shoots, manage drivers and there are many unpredictable factors that they had to work around on the fly. Shooting locations could also be incredibly dangerous. Inside the Masters of Dirt is available on INSIGHT TV from 22nd April 2017 on the channel's 4K UHD SVOD platform, which is available via its website (INSIGHT.TV) to subscribers globally or via iOS and Android devices using the INSIGHT TV App. It's also available on platforms across Europe including Sky in the UK.